Today we are hosting a Cox's #Honey Group #Giveaway so our readers will have a chance to win some raw, unfiltered, pure Honey. 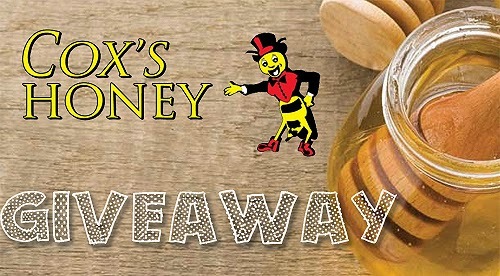 The winner for the Cox's honey has been announced in the Rafflecopter. The giveaway ended today. Thanks again to everyone. Dawn G. is the winner. 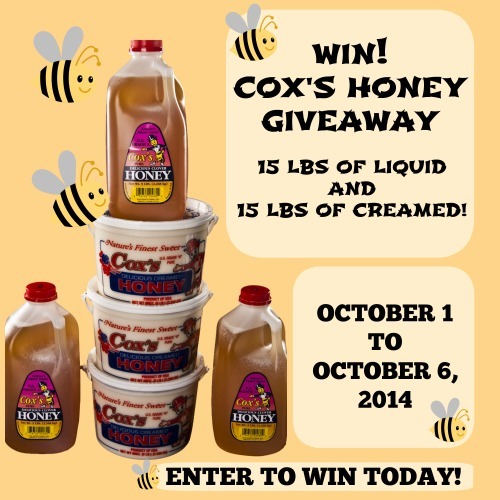 Cox's Honey is sponsoring this giveaway today and we want to thank them for giving us this opportunity. Coxs honey is raw and unfiltered honey. The company was started back in 1880 in Orderville, Utah by Delaun Mills Cox. Mr. Cox produced enough sweet honey for the entire city before moving the operations to Shelley, Idaho. Delaun kept his beehives going more like a hobby. But after World War I he began making more money as a hobbyist than his previous holdings. During the following years honey prices became depressed and in 1925 his son, Orville S. Cox took over his bee business. Orville made the bee business his tool of trade for his livelihood and raising his family. He produced, packaged and sold clover honey. This Cox's Honey Giveaway is open to any resident who is 18 years of age or older who lives in one of the 48 US Contiguous States. This giveaway starts on Wednesday, Oct. 1st at 5:00 am (MDT) and ends on Monday, Oct. 6th at 5:00 pm (MDT). The winner will be notified by email and will have 24 hours to respond. If we do not hear back from said winner in the designated time period of 24 hours we will choose another winner and they will have 24 hours to respond from the time the notification email is sent. Please check your SPAM email folders. What Sets Cox's Honey Apart? Extraction: During the extraction process, each frame of honey is checked and scrutinized. We are thorough in picking out honey frames that may change the quality of the honey. We are also careful in the process of spinning and moving the honey as to make sure it maintains the consistency and characteristics of pure clover honey. Have a question about honey? Take some time to explore our honey facts section. There’s a good chance someone else may have had the same question already! If you still cannot find the answer to your question, use the form on our contact page to submit your question direct to Cox’s Honey. Another important function of the bee is the pollination of the blossoms and flowers. As they search for nectar, they transfer pollen from one flower to the next. Without bees there would not be any argricultural crops, fruit and so forth.